A practical, yet inspirational work that proposes it’s the inner world of our psyches that determines happiness, not outside forces. We have control over our own happiness and this powerful book offers concrete advice on how to tap into it and nourish it all year round. The author focuses explicitly on the positive ways we can establish a higher set-point in our thoughts, speech, and actions, resulting in greater sustainable levels of happiness. Regardless of what the year and your life may bring, we can become measurably and sustainably happier. ©2013 Will Bowen (P)2013 Brilliance Audio, Inc.
Another self help book that has been written 100 times before. Just could not even finish it, am glad I didn't pay full price or I would have had to return it. I feel like I've been thoroughly lectured by the guy at the pulpit. If I wanted to be told I'd be happy if I prayed to god, I'd go to church. The perspective on happiness was enlightening. I enjoyed the book tremendously and will listen to it again. Where does Happy This Year! rank among all the audiobooks you’ve listened to so far? This was my first audiobook... just what I needed to hear. It was as if he was speaking directly to me. I could really relate to the subject and he gave clear steps to follow to become a happier person. Have you listened to any of Will Bowen’s other performances before? How does this one compare? It was too long for one sitting but I wanted to hurry up and get back to listening to it again. It made me think about the things I've gone through and are going through in more depth and from different angles. This audio has helped me focus on the areas of my life that were important to me and to try and keep the bad at bay. 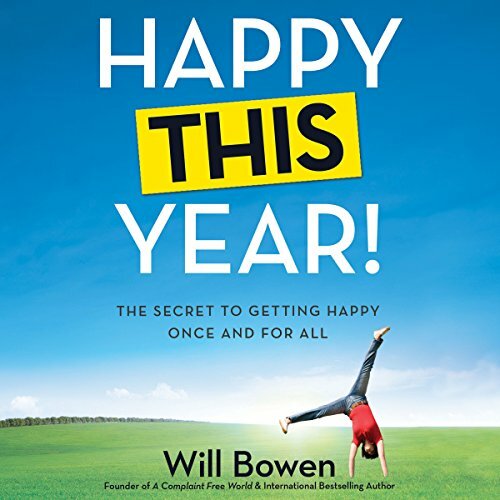 Would you consider the audio edition of Happy This Year! to be better than the print version? Yes. Audiobooks are my choice 90% of the time now over print. What about Will Bowen’s performance did you like? He's upbeat, clear, relatable, not overperforming. No extreme reaction. Perfect book to listen to flying home from New Years vaca, facing back to work first Monday of the year. This book caught me just when I needed something like this, at New Years. and I high hopes that the inspirational message that the author was trying to convey would continue but it quickly deteriorated into preaching and self-serving examples about what a great moral person he is. Ultimately a disappointment. I love this book ! I listened to this book 2 times, then bought the audio version for myself and just finished it for the 3rd time. Great insights,very uplifting and we'll written. I really enjoyed the book. It was very informative. Must read or listen on audio. Starts well, goes a little bit too religious at times, but overall quite a good listen. Lots to put into practice and lots of practical advice. Ultimately we all want to be happy and it really is a state of mind. Narration by author ok.